Businesses like yours face cost control challenges every day. With the high cost of fuel and fleet expenses, a new idea in fleet management might be just what you need. 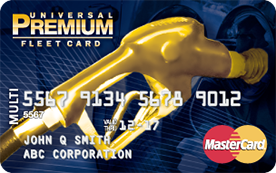 The Universal Premium FleetCard Mastercard® offers complete control over fuel and fleet purchases while allowing fuel fill-ups anywhere Mastercard® is accepted. Not every fleet is the same. We give you the ability to customize each card by driver or vehicle to set up the controls you need for your fleet. You can set fueling transaction controls for the type of vehicles in your fleet or limit the types of purchases each card on the account can make to prevent unwanted spending like convenience store purchases. Access all your account information in real time, all the time. We also provide easy to understand reporting, detailing every transaction on every card, including driver and vehicle listings, transaction data, exemption summary, fuel summary and more. Download full transaction information into your vehicle management system or database means you can integrate your fuel program into your other business processes to keep your financial and accounting records complete and accurate. *Earn up to 3¢ per gallon in volume rebates. Purchases must be made with the Universal Premium FleetCard Mastercard® and the account must be in good standing. Not valid on aviation, bulk fuel, propane or natural gas purchases. Volume rebates are based on the number of gallons purchased monthly and will be calculated on the gallons pumped at Level 3 sites. Unleaded and diesel grade fuels are included. **Earn an average of 2-3¢ within the Retail Savings Network. Purchases must be made with the Comdata Universal FleetCard Mastercard® and the account must be in good standing. The Retail Savings Network is a selected group of fuel locations that allow cardholders additional savings. Rebates are subject to forfeiture for inactivity or if the account is not in good standing. Program pricing re-evaluated annually and subject to change. ***The FleetAdvance mobile application and usage come free with your program enrollment. The FleetAdvance web application is free for the first 60 days. After 60 days, a monthly service charge will be billed to your account. To unsubscribe, call your Customer Support number. Program Terms and Conditions apply. Visit www.universalpremiummastercard.com/terms for details. Fees may apply in some cases, such as for optional services, late payments and/or credit risk. Universal Premium Fleet Card Mastercard® is issued by Regions Bank, pursuant to a license by Mastercard® International Incorporated. Mastercard® and the Mastercard Brand Mark are registered trademarks of Mastercard® International Incorporated.